This month I have shows in Benicia, Walnut Creek, Davenport, San Luis Obispo, Altadena, Ventura, and Bonny Doon. I will be doing a number of these gigs with singer songwriter Chris Kokesh, a rising star from Portland. Back to one of my favorite venues in historic Benicia! I will be at the Johnsmith Songwriting Workshop at beautiful Esalen and then the FarWest Folk Alliance conference in San Jose. This show kicks off my week-long tour with Chris Kokesh. Chris is one of my favorites. Her new CD debuted as No. 20 on the national folk charts. She plays a hot fiddle and sings sweet harmonies on my songs and I love to play guitar and sing harmony on her songs as well. This promises to be a fun show! Chris Kokesh and I will play a set in Sherry’s show at Davenport Roadhouse. Chris and I will be playing back to back sets at this popular songwriter series down the coast. Chris and I are excited to share the stage at this legendary venue, trading songs, backing each other up. We will be accompanied by Peter Andrews as well. Reservations are brisk, so be sure to call for a reservation soon! Directions will be provided when you make a reservation. For reservations contact Midyne or Greg Spear at (831) 458-3563 or email them at: concerts@bonnydoon.com. Directions will be provided when you make a reservation. I hope to see you at one of the shows! I would like to thank all the amazingly generous people who hosted us for shows, fed us, put us up for the night and all those who we met along the way. Thank you for opening your hearts, homes and sharing a part of your world. On August 29th, my high school friend Peter Andrews and I loaded up my Prius for a 10,000 mile, 26-state, musical journey across the country. We loaded five guitars, microphones, amplifiers, suitcases, boxes of CDs and gear into the back of the car. By the time we returned home in the first week of October, we had acquired additional baggage: a friend’s banjo and a set of golf clubs. But somehow, mysteriously, the load seemed to get smaller and smaller every day as we learned to fit the pieces together just so, until we had an unobstructed view out the rear window. I thought of Tom Sawyer’s journey down the Mississippi. And that is what it felt like…that we were simply floating down the river from one adventure to the next. So often I have tried to understand and solve things in my life, and yet when we went on the road, I just listened. And I was rewarded with surprises. I was surprised by the gentle beauty of eastern Oklahoma, and the grandeur and solidity of the painted rocks of Utah. I was drawn to the lapping water of the lake next to Lang and Irina’s stone and shingled home in Martha’s Vineyard. I still see the candlelit natural stone stage in the Kentucky woods, where we shared songs on a warm surreal night, backed by a chorus of crickets. Peter and I shared so many laughs, often triggered by the things we saw on the road. One of our favorites was the road sign that advertised FIREWORKS, LINGERIE, COLD BEER….AND SNAKE STUFF! It was hard not to stop in and load up on that cornucopia. I was touched by the people we met…a young soldier coming home to his bride in North Carolina who slowed danced to our set, three couples from Boston who Peter and I shared an evening with in Sea Island, Georgia, and then who came to our cottage the next night for an impromptu house concert and wine tasting. I thought about how we are often divided up in this country by geography and labels. And yet when we are simply there to share, experience and listen to each other, those labels and differences melt away. 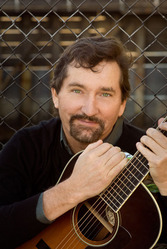 On September 11th Peter, Larry Diehl and I played at a concert series at Virginia Beach. As we were playing, it struck me that the profound lesson of 9/11 came not from the hate and blind zeal behind the tragic event, but from the love, courage, and selflessness of people pulling together in response. I saw a film about shooting the rapids on the Snake River by a naturalist/adventurer when I was in grade school. The host and narrator survived off the land during his week long journey on the river. One thing he said in his talk our class stuck with me: that wherever you find a poison or venom in nature, there will be an antidote growing nearby. You just need to find it. This is the puzzle: as I let go and just floated down the river, we seemed to end up in the perfect place. I felt like I was doing nothing to make it happen, yet it all fell into place. It was as if the less I worked and tried and wriggled, the more magical the journey became.